Over the Weekend I visited one of my favorite places here in D.C., Eastern Market. I shared with y'all some tips on Tuesday for picking out the best and freshest produce. Now that you've got your goodies from your local farmer's market (or for others, from your grocery store), it's time to start making some scrumptious meals with them! In true Kristyn fashion, dessert comes first! So I thought I'd share with y'all one of my favorite summer desserts that my mother made. 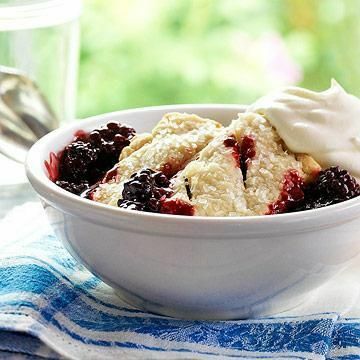 Whether you're a fan of blackberries or not, this recipe can be done many different ways. However, my favorite has been Blackberry Cobbler. It only takes a few ingredients to make a wonderful impression after any meal is done! Melt the margarine in a long baking dish. Mix the flour, sugar and milk until well mixed. Pour over the melted butter. DO NOT STIR!! Pour the berries over the mixture, and again DO NOT STIR! Bake at 350 degrees until crust rises and browns. Around 30 minutes depending on your oven. You can use any fruit you want, such as blueberries or peaches. Serve with some vanilla ice cream and enjoy!